Alcohol Content: Ethyl Alcohol (95% v/v) 43.8% w/w. Diethyl Pthalate 1% w/w. “Pressurized container. Protect from sunlight. 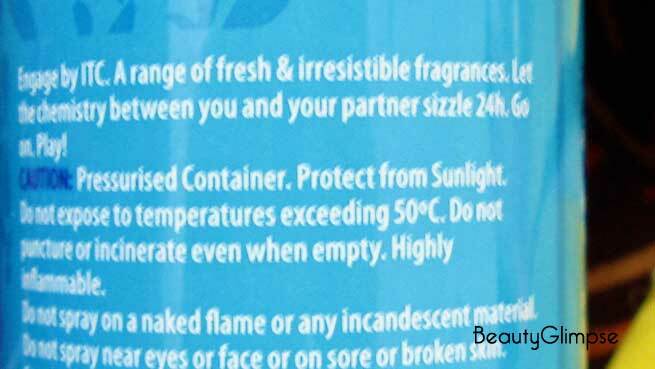 Do not expose to temperatures exceeding 50-degree C. Do not puncture or incinerate even when empty. Highly inflammable. Rs 175 for 165 ml./110 gm. 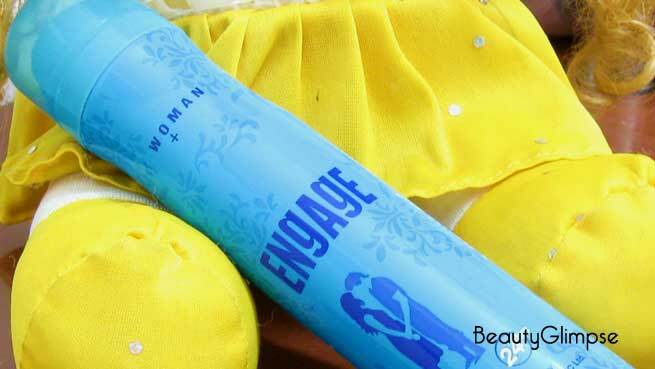 Engage Woman Spell Bodylicious Deo Spray comes in a tall and slim bottle. The color of the sleek bottle is regular blue with simple graphics designs and all necessary information printed on its body. The construction of the sturdy bottle is quite similar to that of other deodorants, but the extra height makes it different from others. There is a soft plastic cap on the top of the bottle, which is semi-transparent and hence, allows us to have a glimpse of the opening of the can. The simple and neat design around the nozzle of the bottle makes spraying an easy affair. It also helps in releasing just right amount of the deo during each application. Though the simple and vibrant bottle grabs our attention easily, it actually is not a very travel-friendly packaging, I must say. The huge bottle doesn’t fit a small bag or purse, while the cap is quite loose. It slips from the tops and the opening of the bottle gets uncovered every now and then. The deo spray has an aquatic or marine fragrance with a floral base note. It is a truly refreshing and invigorating aroma that I love very much. It may feel a little heavy at first, but it is actually not. The best thing about this deo is that it does not bother sensitive noses. I also didn’t develop any sort of irritation or stinging sensation. Rather, it gives a very cooling and soothing sensation right after application, which is amazing! Conversely, the worst thing about this deo is that its fragrance fades away shockingly soon in comparison with its sky-high claim! I was really surprised to see that it claims to last as long as 24 hours. But in reality, the scent starts to vanish after 4 to 5 hours of application and after 13 to 14 hours, you will not be able to find its trace. However, it is a decent buy for people who want their deo spray to have mild sweet aroma and a cooling as well as refreshing effect. Not very recommendable. If you are dying to try something new, go and get one. 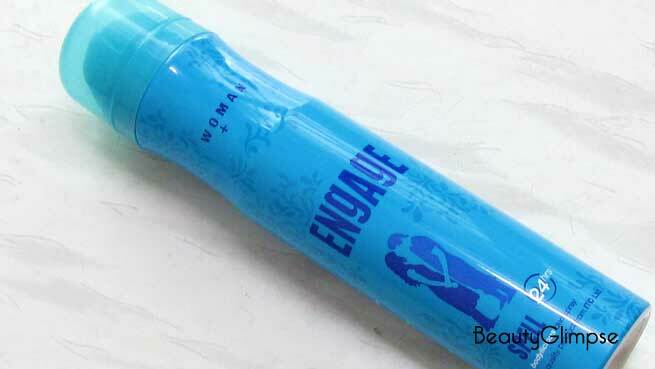 Otherwise, pick a deodorant , which is easy to carry and has a long-lasting fragrance.